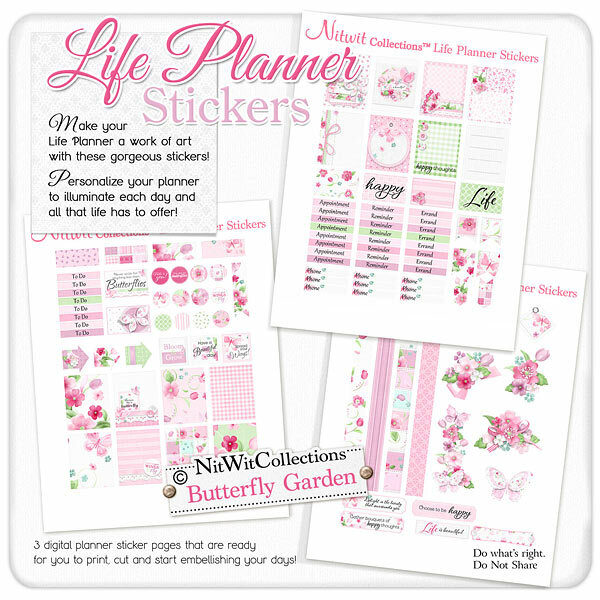 "Butterfly Garden" Life Planner Stickers takes you to a place of soft tranqility! The cottage chic feel with beautiful colours, the flowers and of course the butterflies of this digital life planner sticker kit will be sure to bring lots of cheerful and pretty pages to your planner. 4 - 1.5" wide box strips...where do you see these digital elements in your pages?! 2 - Arrow elements which would make great bookmark elements when affixed to a paperclip! 3 - Square embellished tags, each with a very different look and sentiment. We hope they allow you to "Have a Beautiful Day"
12 - 0.6" circle digital elements with so many varied options...which one will you use first?! 4 - Amazing floral clusters that you can place anywhere in your life planner to add such beauty and grace. 1 - Butterfly and flower vertical garland....can you see this growing up the side of one of your pages? !